The European Challenge Tour will return to Northern Ireland for this first time in 10 years this summer in an event which will place at Galgorm Castle. And in a further coup for Galgorm, the club has secured the participation of Northern Ireland's four-time European Tour winner Michael Hoey. Hoey will join the other hopefuls at the Northern Ireland Open Challenge from 29 August to 1 September. He will also undertake an ambassadorial role at the £145,000 event. "I thought I would try and help out and give something back," said the Belfast man. "It's a privilege for me to take on the ambassadorial role and to play in the tournament as well because it's a really nice place." Hoey will be the big local draw in the field but knows full well that he will not have it all his own way at the Ballymena venue. "There will be several other winners from the main European Tour in the field as well for sure and there will be a lot of players that people will know," added the 34-year-old. "It's very hard to hold on to a full European Tour card these days and there are great and experienced players on the Challenge Tour in addition to the hordes of young guys who are hoping to make their way upwards. "I know what it's like to play on the Challenge Tour. The quality of play at Galgorm will be of a very high standard," added Hoey, whose stint on the Challenge Tour included three victories. 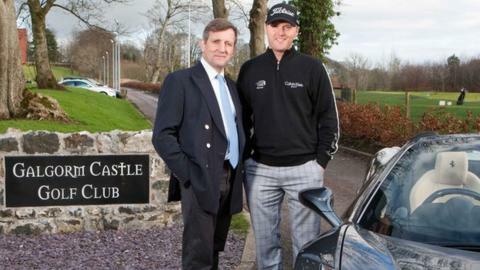 Galgorm Castle has successfully hosted the third tier EuroPro events over the past three years and European Challenge Tour Director Alain de Soultrait says that the Ballymena course has established itself as a "superb venue". "We are sure that in the coming years this will grow to become one of the premier events on the Challenge Tour schedule, creating more and more opportunities for talented young golfers throughout Ireland," added the European Challenge Tour official. "We are delighted to bring the Challenge Tour back to Northern Ireland, a country which has experienced such great success on the world golfing stage recently and which produced record crowds at last year's Irish Open. "We must thank everyone at Galgorm Castle for their commitment, enthusiasm and determination in making this tournament happen." The staging of the EuroPro events drew big crowds to Galgorm and the club's general manager Gary Henry is promising another "memorable" event. "The excitement is already building ahead of the tournament," he added. "With the support of the people of Northern Ireland, we plan to make this one of the most exhilarating events on the Challenge Tour's international schedule." The top 20 players in the end-of-season Challenge Tour rankings earn full European Tour cards for the following season. Those competing on this season's Challenge circuit include European Tour winners Ross McGowan, Nick Dougherty and Daniel Vancsik plus former US Amateur champion Peter Uihlein. On the last occasion that the Challenge Tour came to Northern Ireland, Darren Clarke acted as host for the event staged at Clandeboye and the Dungannon man went on to win the tournament. Hoey finished 15th in the event and sharing 12th was Louis Oosthuizen who went on to win the Open Championship seven years later.